Designed to help you get the most out of the downtown Pittsburg area, Route 381 is the perfect way to enjoy downtown and the surrounding area. 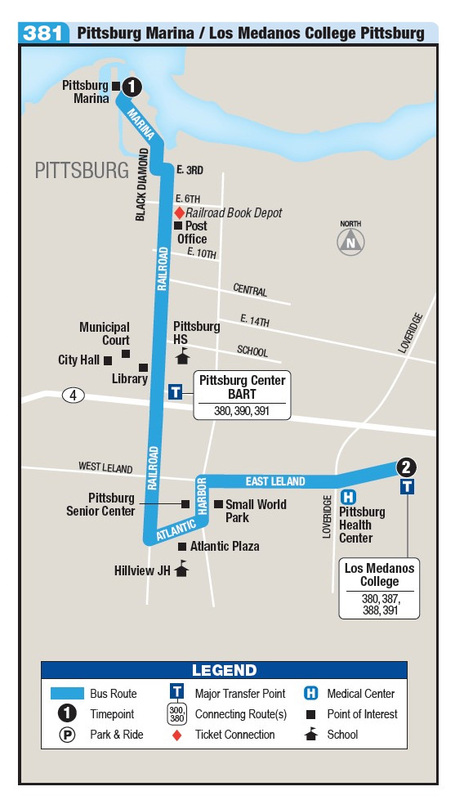 Tri Delta Transit’s Route 381 is a quick 20-minute trip between the Pittsburg Marina and Los Medanos College. In between, you’ll be able to hop off the bus at over 36 locations to, enjoy lunch downtown or do some quick shopping and have time to quickly get back to school, work or wherever you need to be. PLUS, Route 381 is your quick connection to the Pittsburg Center BART station! See how Route 381 fits into your schedule and plan on enjoying this Downtown Circulator from Tri Delta Transit.